4 Challenges! A winner in each Challenge! 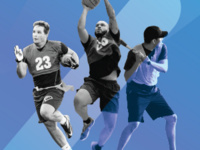 If you compete in all four competitions (NFL Combine, NBA Skills, Fitness Challenge, and MLB Skills Assessment) you are eligible to win the ultimate Intramural prize and destined to be crowned the best of the best! The Intramural Sports program provides you the opportunity to compete and have fun in various team and individual sports. Leagues and tournaments are organized into different skill levels so you can play against other participants with comparable skills in a relaxed recreational atmosphere. Flag football, basketball, volleyball, soccer, softball, racquetball, golf, and tennis are just a few of the sports offered.